As you may have noticed, yesterday we made some changes to mysmelly. But I did want to point out some new and improved things. Our search system works like a charm now! We have a new "holiday mode" which you can set if in your profile if you decide to go away for a while and would like to let your friends know. We've cleaned up the Shortcuts so now you can view discussions/questions with no replies. And lots of small other things, not to mention that we've cleared out nearly 200 bugs. We've tried to clean the site up so browsing is quick, fun and comfortable. We will update the FAQ's shortly. If you come across any problems let us know! Please always mention which browser you are using so that we can test. For your info, we are mostly optimised for Firefox. 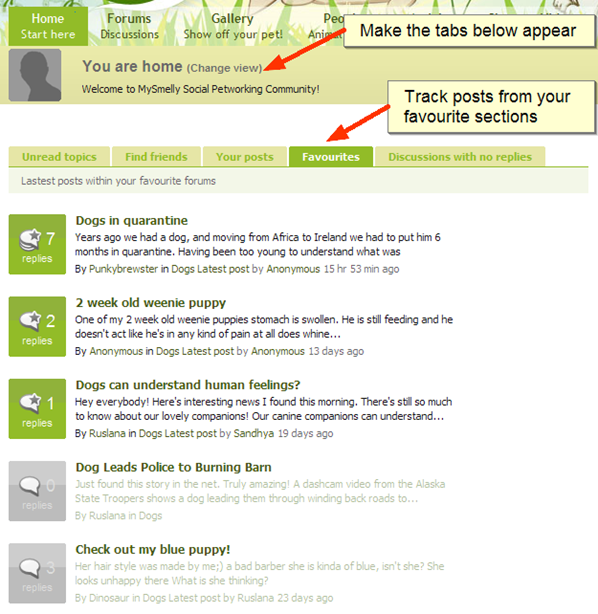 - You can add forum sections to favourites and follow the activity there (see the screenshot below). Wow girls! Thanks for the changes. I already love them. The holiday mode and ratings are just an awesome addition! Looks like I'm getting a bit mad about ratings now. I rate everything! All the ratings are being collected, it helps rank and order the site according to what's good and what's not - so thanks! !